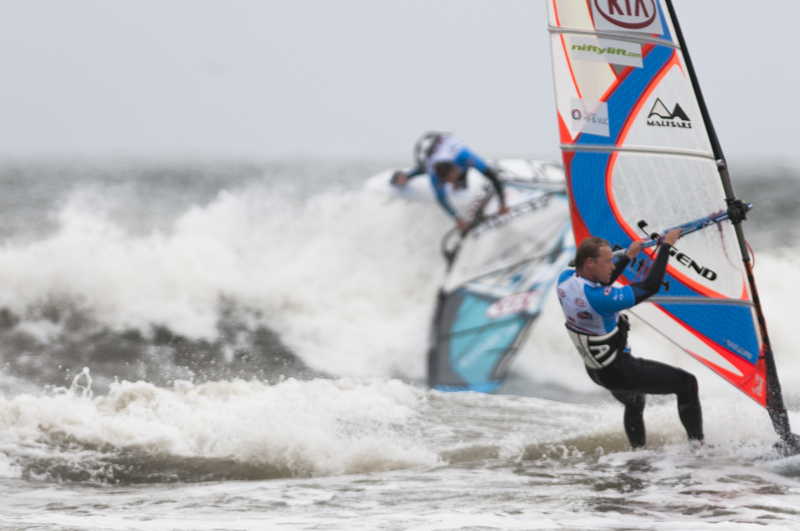 They kickstarted the PWA pro tour event in Klitmoeller monday this week – despite that Denmark windsurfing spot one has received much attention for great surf through decades, the number one danish windsurfing spot was not able to deliver upon expectation – until today that is! Within 2 hours the surf changed from plain flat to agressive white horses, delivering conditions that we all wanted – whether the PWA pro circus or just us spectators visiting from near and far away. From the very first heat we got what we came for – high performance from almost everybody. Taking the changing conditions into consideration it turn out to be at great day at the beach – even though the rain kind of got in the way of the lens I loved every minute. Qualifications was tough thus fantastic and dramatic competition for the spectators that despite the wet conditions stayed and enjoyed the action. At lunch time I sat with some of the guys and we talked about how much time spend waiting on the beach scouting for wind, trying to learn and understanding the waves and ocean specifics. Sometimes waiting for most of the week and then having to perform on short notice, against tough competition. It is NOT easy, but it looks easy when the pro’s exercise the hard earned skils. I hope I banked a great snap or two that you all can appreciate. Was there last year to see the PWA at Klitmøller (I’m Danish), but was not able to make there this year… Hope you’re enjoying and that the wind will be with y’all!